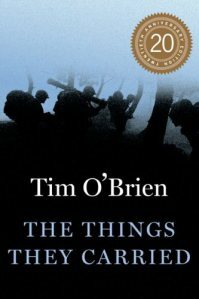 10 Books to Read: "The Things They Carried"
Tim O'Brien masters the art of blurring the lines of fiction and nonfiction in his war novel, "The Things They Carried." In the short story “How to Tell a War Story,” O’Brien writes, “In many cases a true war story cannot be believed. If you believe it, be skeptical. It’s a question of credibility. Often the crazy stuff is true and the normal stuff isn’t, because the normal stuff is necessary to make you believe the truly incredible craziness. "The Things They Carried" is a series of short stories that follows a soldier, also named Tim O'Brien, and the members of his platoon. It shifts between first-person excerpts from the main character's point of view to the stories of the platoon members. From page one, O'Brien beautifully describes the physical aspect of what each soldier has to carry from the emotional baggage to the weapons and the good luck charms. What makes this novel an impressive one is how authentic it is through the different characters. Of course it is semi-autobiographical, but the reader never questions what is real or no real, because it doesn’t matter—the message is still the same. There are no winners in war, and the collection never romanticizes war despite its beautiful diction and framing. The Vietnam War was an especially rough war, and it’s easy to think that it was an entire lifetime ago. It ended only 39 years ago. There are many memoirs, novels and films that discuss the effects of war, that remind people of the heroic efforts of troops, and that show the best and worst of human beings. “The Things They Carried” is so special because it encompasses many of and is told through someone who has been there before and cares about the way the experience is presented. I may never know what it is like to be in a foreign land, physically fighting for something I don’t truly understand, but among the many works of art that attempt to show me, “The Things They Carried” will always be close to my heart. Johnny Cash brings back real country music with "Out Among the Stars"